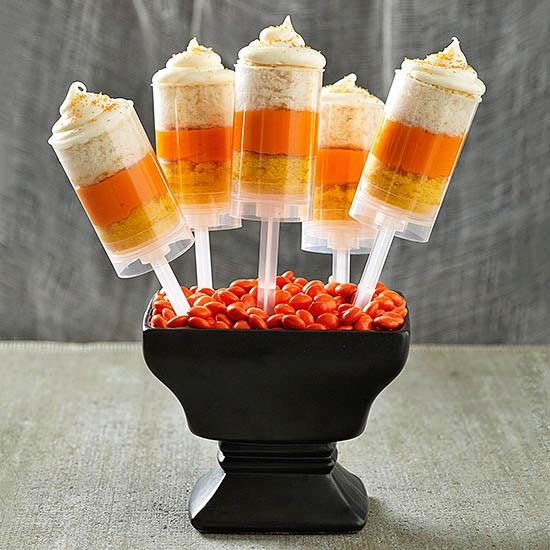 Candy Corn Push-Up Pops ~ Craving a big bag of candy corn? Get your Halloween sweet fix a different way with these creamy cake push-up pops. To make, follow these steps: Preheat oven to 350 degrees F. Grease two 8x8x2-inch baking pans and line with parchment paper; set aside. According to the recipe, prepare, divide, and tint the cake batter. Bake for 18 to 20 minutes. Once the cake has cooled completely, transfer to a cutting board. Prepare the orange filling and cream cheese filling according to the recipe instructions, then spoon both into separate pastry bags fitted with a large round tip. Use the open end of a push-up container to cut the cake into circles. Pipe cream cheese filling into the bottom of each container, then insert one yellow cake circle, followed by orange filling, one white cake circle, and cream cheese filling. 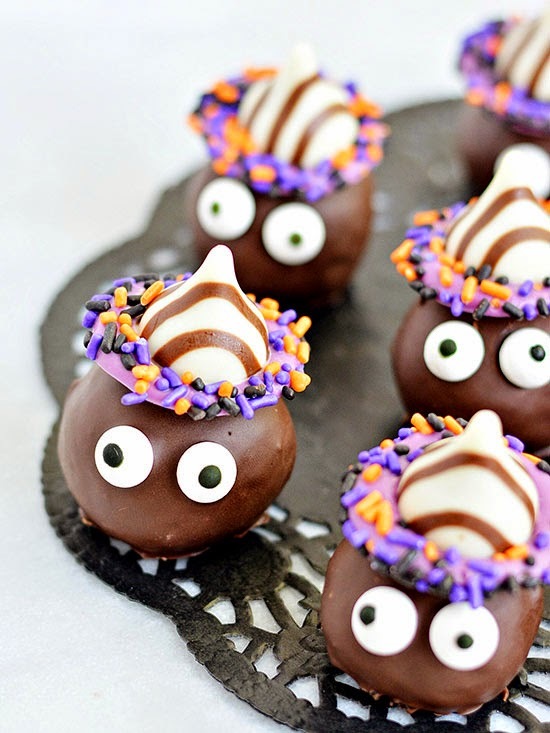 Goblin Cookie Truffles ~ Boo! These adorable little goblins are made from everyone's favorite snack, chocolate sandwich cookies. They're frightfully good! To make, follow these steps: Crush sandwich cookies in a food processor. Combine softened cream cheese and cookie crumbs until evenly mixed together. Form cookie mixture into 1-inch balls, and place them on a waxed-paper-covered baking sheet. Chill for 1 hour or until firm. Melt purple candy melts over a double boiler; once melted, transfer to a piping bag. Pipe small circles onto a waxed-paper-covered baking sheet. Immediately press an unwrapped chocolate kiss into the center and add sprinkles around the brim of the hat. Refrigerate for 20 minutes or until chocolate is set. These goblin hats will sit on top of the cookie balls. Once cookie balls are firm, dip them into melted chocolate. Use a fork to lift the balls from the bottom and transfer back to baking sheet. Apply candy eyes to cookie balls by gently pressing them in. Immediately top goblins with the chocolate kiss hats. Allow truffles to set for 30 minutes in refrigerator. 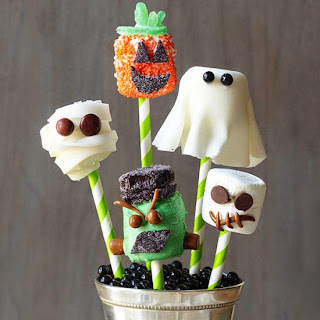 Marshmallow Pops ~ A marshmallow, a straw, and your kid's imagination are all you need to create a collection of frightful friends. To make, follow these steps: Skull- Insert a straw into each marshmallow. Press in two chocolate pieces for eyes. Flatten chocolate caramel logs and cut into thin strips. Use strips to form "mouth". Mummy- Insert a straw into each marshmallow. Roll fondant to 1/8-inch thickness and cut into 1/4-inch wide strips. In a small saucepan cook and stir candy coating until just melted. Cool slightly. Dip marshmallows into candy coating and wrap fondant around wet marshmallows. Place on waxed paper to dry. Attach "eyes" with additional melted candy coating. Ghost- Insert a straw into each marshmallow. Thinly roll fondant. Divide fondant icing into 8 portions. Roll each portion into a 4-inch circle. In a small saucepan cook and stir candy coating until just melted. Dip marshmallow tops into candy coating. Drape a fondant circle atop each marshmallow. Press in black sugar pearls for eyes. Pumpkin- Insert a straw into each marshmallow. In a small saucepan melt candy coating over low heat, stirring occasionally. Cool slightly. Spread marshmallows with candy coating and sprinkle heavily with orange nonpariels. Flatten black gumdrops and cut into shapes for eyes and mouth. Flatten green gumdrops and cut into into leaves and stems. If necessary, secure with candy coating. Frankenstein Monsters- Insert a straw into each marshmallow. In a small saucepan melt candy coating over low heat, stirring occasionally. Cool slightly. Spread marshmallows with melted green candy coating. Flatten gumdrops and cut for hair and mouth. Attach candy-coated chocolate pieces for eyes. Slice two of the candy logs for bolts. Flatten remaining candy logs and cut into strips for eyebrows. 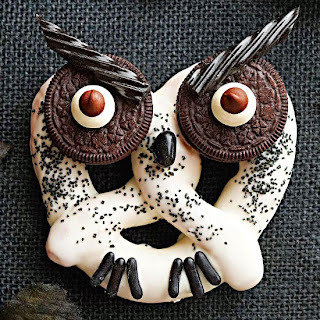 Haunted Hooting Owl Pretzels ~ Whoo-oo dare eat this menacing owl? Everyone! Though they look especially spooky, these chocolate-dipped pretzels are a hoot to make. To make, follow these steps: Dip large pretzels in melted confectioner's coating. Place the pretzels on waxed paper. As the coating sets, sprinkle with coarse black decorating sugar. Press a black jelly bean onto the twist of each pretzel for the nose, and small pieces of licorice candy onto the base of the pretzels for the talons. Separate a sandwich cookie and press the halves onto the pretzel for eyes. Ice white candy pieces and press onto each cookie eye, then add chocolate chips to them for pupils. Use black licorice twists as eyebrows. 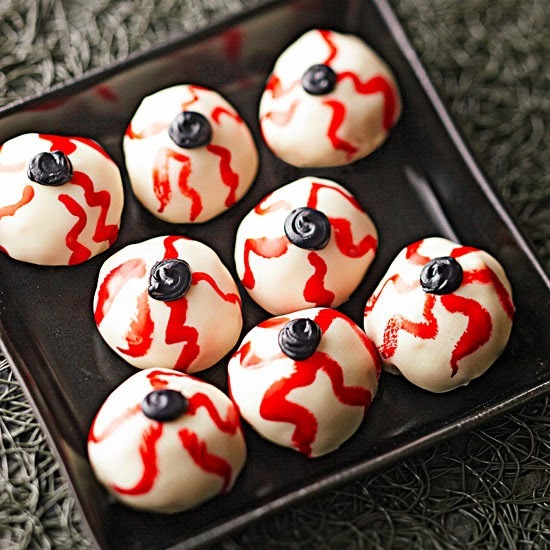 Bloodshot Peanut Butter Eyeballs ~ You won't be able to take your eyes off of these eerie Halloween peanut butter bites. Not only are they eye-catching, but they're also irresistible at any festive event. To make, follow these steps: In a mixing bowl stir together 1/2 cup peanut butter and 3 tablespoons softened butter. Gradually add 1 cup sifted powdered sugar, stirring until combined. Shape into 1-inch balls; place on waxed paper. Let stand until dry (about 20 minutes). Chop 8 ounces of vanilla-flavor white candy coating. Place in a heavy saucepan; cook and stir over low heat until melted and smooth. Cool slightly. Dip balls, one at a time, into coating. Let excess coating drip off peanut butter balls. Place on waxed paper; let stand until coating is firm. Use a clean small paintbrush and red food coloring to paint veins on the coated peanut butter balls. Pipe small dots of black icing for pupils. 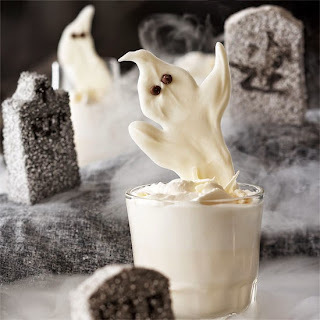 Sweet White Chocolate Ghosts ~ There is something ghoulishly great about topping your favorite vanilla milk shake with a hauntingly sweet white ghost. To make, follow these steps: Line a baking sheet with waxed paper; set aside. Coarsely chop desired amount of white chocolate (about 2 ounces). Place in a small microwave-safe bowl. Microwave on high about 1 minute or just until melted and smooth, stirring every 20 seconds. Place melted chocolate in a small resealable plastic bag; seal bag. Use kitchen scissors to snip a very small piece off one corner of the bag. Pipe small ghost shapes on prepared baking sheet. Add two miniature semisweet chocolate pieces to each ghost for eyes. Allow to stand until white chocolate sets. Peel off waxed paper. Witching Hour Chips and Dip ~ Cast a spell on your next Halloween party with this savory snack. 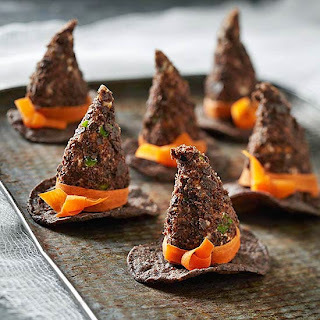 Though it might look like you should wear them, these fashionable witch hats are actually taco-flavor cheese balls atop tortilla chips. To make, follow these steps: According to the recipe instructions, prepare the cheese dip and let chill for up to 24 hours. Once thoroughly chilled, shape the cheese mixture into 1-inch balls, using about 1 tablespoon for each, then roll into cone shapes. Roll the cone shapes in crushed blue tortilla chips, pressing lightly to adhere. Use a vegetable peeler to get thin strips of carrot for the hat brim. Tie the carrot strip in a loose knot, or use the cheese ball mixture to secure the hatband. Place each cone atop a tortilla chip to create hat brims. Serve immediately. 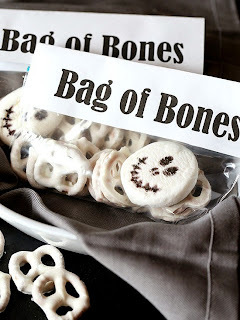 Bag of Bones Snack Mix ~This spooky snack mix comes together in a snap! Perfect for trick-or-treaters, these individual bags are scary good. To make, follow these steps: 1. Flatten large marshmallows. Using a black food writer, draw a skeleton face onto the marshmallows. Set aside to dry. 2. Place a handful of white chocolate pretzels in a bag. Place a marshmallow skeleton head into the bag and seal. 3. Using blank white paper, write or print "Bag of Bones". Cut the label to the width of your bag and fold over. Attach using double-stick tape. Little Monster Sandwich Cookies ~ No need to worry -- these monster sandwich cookies won't bite! 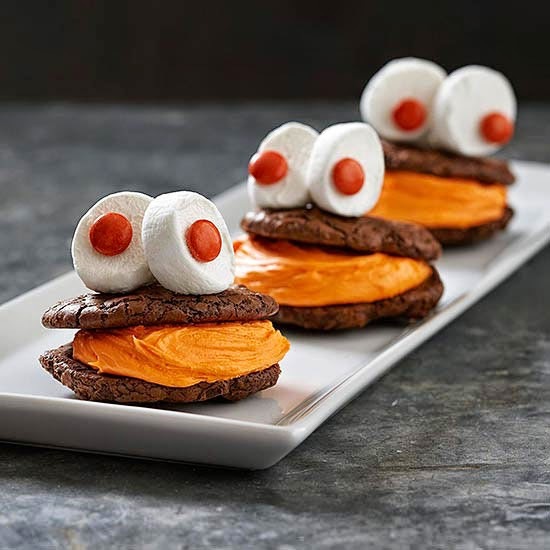 Soft chocolate-espresso cookies filled with rich orange mascarpone cream make for quite the spooky sweet, especially when topped with big marshmallow eyes. To make, follow these steps: Following the recipe, make the cookie batter and chill for 30 to 60 minutes, then bake at 350 degrees F according to the directions and let cool completely. Prepare the orange filling, and spread about 2 tablespoons on half of the cookies, bottom (flat) side up. Press the flat sides of the remaining cookies against the filling, tilting the top cookie to resemble a mouth opening. Cut marshmallows in half, and attach a candy-coated peanut butter piece to the sticky side of each marshmallow half. Cut a small wedge from the bottom of each marshmallow eye to create a sticky base; immediately attach two eyes to each cookie so the eyes stand upright on the sandwich cookie.